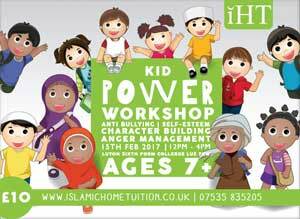 The objective behind the Kid Power workshop is to essentially encourage children to be confident, well-rounded individuals. This will be done by demonstrating a number of techniques in how to develop self-esteem, overcoming bullying, selecting the right company and being involved in character building activities. It will also be our aim that whilst this workshop is being delivered, we are able to link each of the said areas to Islam. The life of the Messenger of Allah (s) and all those that followed him in the early generations, show a richness of narratives and anecdotes that promote confidence, justice and the instilling of great character traits. There are many more factors that play an important role in confidence building. We see that in the life of the Messenger (s), he would delegate tasks appropriate to the ability of the individual to whom the task was given to. Bullying comes in various forms, shapes and sizes and can almost be found in any setting where human beings exist. However, it is arguably the most damaging and leaves the longest lasting impact when children are the ones who have to endure it. Allah (s) frequently mentions oppression in the Noble Quran and consistently warns human beings against it. Abuse whether physical, verbal or psychological is strictly prohibited in Islam and therefore a zero tolerance policy must be adhered to. A new form of victimisation that has surfaced, due to the age we live in is cyberbullying - bullying that happens over the internet. There are many factors that play a part before this becomes an everyday reality for a child but one factor that is more contributing than others; the overuse of the internet. Parents must bear the responsibility of ensuring their child is mixing with the right crowd. The key to this lies in being involved and connected with your child. The Messenger (s) said that you are on the religion of your friend, and therefore having good company can make all the difference. It is also important to keep children around family members and relatives that they may look up to. Role models have always played a part in the human psyche and it is for this reason that children should be surrounded with people who have good morals and characteristics. Children must have exposure to the outside world as this gives them room to develop in ways that being cooped up indoors all day will not allow. As some researchers have put it, we are encouraging and are passively complicit in creating a generation of ‘couch potatoes’. This is a huge problem on an epidemic scale and must be corrected immediately. We should look for sports and activities for our children that cultivate patience, team work, fairness and endurance. Having some angry feelings is normal at all ages from time to time, but some children and young people struggle more than others to control these feelings and to sort the problems out. Angry feelings and aggressive behaviour can be very hard to deal with however there are many tools that can be used to overcome anger. Allah's Messenger (s) said, "The strong is not the one who overcomes the people by his strength, but the strong is the one who controls himself while in anger." This narration of the Messenger of Allah (s) will be mentioned to students throughout the anger management segment.